Let’s start with the obvious. The obvious driver for the market both current and moving forward continues to be the Fed. Monetary policy is the biggest driver and clearest driving force behind the market’s fluctuations. The recent never-ending Dovish tone from the Fed suggests that rate hikes are not on the horizon through the end of 2019. The Fed also communicated an official course for the balance sheet. Simply put, they stated that quantitative tightening (QT) would wrap up at the end of September. This will leave assets at “a bit above $3.5 trillion” on the Fed’s ledger. Though this course of action was new, it was not totally shocking considering the deterioration of economic data points from December and into February. The market actions however suggest that the Fed’s “easy” attitude may in fact be detrimental/threatening to unleash some speculative fire. So far, 2019 has been a monster year for the overall markets as positioning and sentiment hit extremes not seen since 2009 headed into the new year. The S&P has been up as much as 24% in less than three months. Yet, through that time, fund flows for equity mutual funds and ETFs are in fact negative. In layman terms, money has been flowing out of stocks and into bonds. This negative flow has presented a terrible predicament for traders because the run has been so powerful that it’s difficult to buy, but the lack of exuberance (or even optimism) in many sentiment and exposure indicators makes it very difficult to short. Thus exists the vexing scenario of overbought and underowned. A tug of war currently exists in the marketplace. This monetary debate exists between those who own stocks and are steadfast in their ownership refusing to sell as they do not believe the cycle is over, and those who are out of the market and have begun preparations for the next coming recession. The winner of this ongoing tug of war will likely be the individuals who turn out to be correct on the economy. As of late, the PMI data out of the EU late last week was a very important driver. It resulted in a quick reversal of the market’s post-Fed breakout and tipped the 3Mo-10Yr treasury yield into inversion territory for the first time since July 2006. ﻿The BofA Fund Manager Survey has shown a disregard for equities among large portfolio managers. Cash levels have been consistently high and positioning has been defensive basically all year. Fund flow data backs this up perfectly showing large net outflows from equities throughout 2019. But, as noted, it is otherwise a completely non-descript moment in terms of sentiment data points. EU economic data has deteriorated in 2019. The most recent PMI data point for Germany came in under 45 (anything under 50 is considered contractionary). That data sent the US 3Mo-10yr treasury yield spread into its first inversion of this cycle. The last time that happened (the first inversion of a cycle) was in July 2006. If you are to look back at several decades worth of data, this event has always been followed by a recession in the US within the following six quarters. Should this time be no different, we have til the end of 2020 before we start seeing some serious heat on the US economy. Often considered the lifeblood of the economy, banks are the proxy for equity traders. As the yield curve flattens (or inverts), the profitability behind lending disappears. It is important to note that the Gold story is not about inflation right now. As we already know, relative to years past, QE does not really have the effect that everyone out there believe(d) it does in the past. What I mean is that QE does not boost economic activity like it allegedly is supposed to do. So with that notion in mind, we know that the idea that QE will stimulate the economy is kind of a fallacy. This creates added risk in the marketplace as the idea behind QE is less powerful than it once was. This issue likely will push federal banks to push the envelope a little too far (they are human after all) and when that occurs, economic uncertainty will ensue. 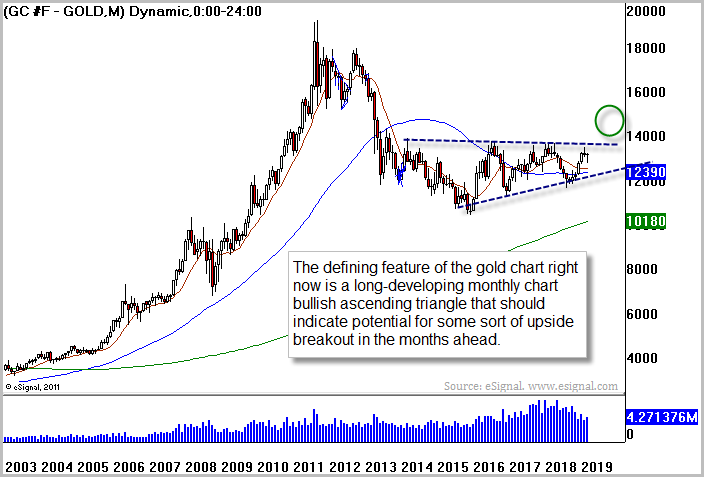 This uncertainty likely will flock money managers into gold as we get closer to a narrative behind the “cycle end”. The gasoline crack spread is the profit margin (not including costs) of refining a barrel of oil into gasoline. It has been the clearest indicator of Crude Oil over the past 6 months. If the crack spread declines sharply it means that there is too much refined gasoline already out there, and reduces the incentive for refiners to stock up with new crude oil to refine. This typically coincides with a gasoline glut. The decay in oil prices during Q4 (from around $75 to around $42) was nicely foreshadowed by a dive in the crack spread. It is important to take note of this as the opposite is currently taking place. The crack spread has been widening sharply over the past few weeks. After hurricane Harvey hit the Texas coast and shut down refinery operations for a month in the fall of 2017 refiners executed the classic behavioral risk maneuver where they overcompensate to “prevent something like this from happening again.” Simply put, they stockpiled a glut of refined gas. Now that we passed through hurricane season in 2018 with no major storms, the gas glut has been worked off. In general this is a bullish situation for oil. That said, keep an eye out on the dollar on the heels of the EU dropping. Also it will be wise to keep your eyes peeled for overall economic demand slowdown internationally and internationally. Those headwinds could offset the crack spread indicator moving forward. China has been stimulating aggressively into the thick of the trade war. With that said, any hint of the trade kerfuffle ending will likely pay off for Chinese equities more than just about any other asset class. That said, copper appears to be a close second given how levered copper is to the Chinese growth story. Keep your eyes on “doctor copper” and on the shanghai index moving forward. Especially should a resolution come down the pipe. I am a believer that markets do not typically give investors too much time to sell the tops and to buy the bottoms. The longer we churn around up here at these levels the more I am inclined to believe the irrational behavior in the marketplace will continue. Should “bad news” start to have the effect of “bad news” in the marketplace we will be able to discern that fairly quickly and we will have a direct ceiling to trade against. I want to stress that I am not an advocate of buying stocks here (in fact I am predominantly in cash), but rather, that the longer we hang out at these levels, the more likely the path of least resistance will be to resume higher. Below I have highlighted some market charts to keep an eye on in addition to the charts provided at the beginning. As the above shows, the overall market is banging around in a wedge that began the 21st of March. 2850ish-2870ish will provide as resistance to the upside and the 200 day “should” provide an initial floor should the 2785 level break.